ED: As one of Mr. Lendman’s readers I am awaiting his return and his great contribution in revealing Truth. Estimates on the possible cost of the military campaign have varied. Last week, a defense spending expert, Gordon Adams, a professor of US foreign policy at American University, told Huffington Post he estimated the United States’ war on the militant group could be costing taxpayers up to $1.5 billion a month. You know the story: all Muslim and Arab American organizations in DC have fallen under the direct influence of Gulf regimes, as have most Arabs journalists in the capital. This happened right after 1990 when the Saudi regime sent various princes to close the deal to control all Arab media and organizations in the West (as many were under the influence of Saddam or Qadhdhafi). Saudi Arabia did not want dissent from Arabs in the West lest they disturb their lobbying and propaganda efforts in the West. I read that CAIR and other Muslim American organizations held a press conference to issue statements against ISIS: as if any Muslims in the US or elsewhere listen to them and adhere to their standards. And why is it their business to issue exclusive denunciations? Were Jewish organizations expected during the savage war on Gaza to issue statements of denunciations against Israeli terrorism? And don’t they with their theatrics not reinforce the association between Islam and the terrorism and kooky ideology of ISIS (shared by the same patrons of Arab and Muslim organizations in DC)? They should if they want condemn terrorism in all its form and not focus on “Islamic terrorism” and they should even categorically reject the notion that there is a religious label to terrorism. But then again: it is a job and they have to do it and those are willing to abandon two of the five pillars of Islam in return for a photo op at the White House. Instead, they should say that ISIS should be blamed on the foreign policies of the US and its allies who have in the last several decades produced the monsters of Al-Qa`idah and ISIS, among other terrorists roaming the Middle East region. “United States is world’s leading terrorist state,” Professor Noam Chomsky said. “Israel is complicit in global state terrorism,” Steve Lendman said. In fact, when it comes to terrorism, wars and espionage, United States has been the major target of the Zionist entity. Watch a video below. On September 23, 2014, in a televised speech, Hizbullah leader Sheikh Hassan Nasrallah spoke about the crisis in the region and Barack Obama’s coalition to “degrade and defeat ISIS terrorists,” the very terrorists America played midwife for the sole purpose of destroying regional opposition to Israel’sexpansionism. He said that Lebanon refused to join the anti-ISIS alliance lead by United States, as the later is not a trustworthy partner. The United States itself is leader of state terrorism around the world and only interested in its own imperial agenda in the region and to maintain Israel’s supremacy in the region. 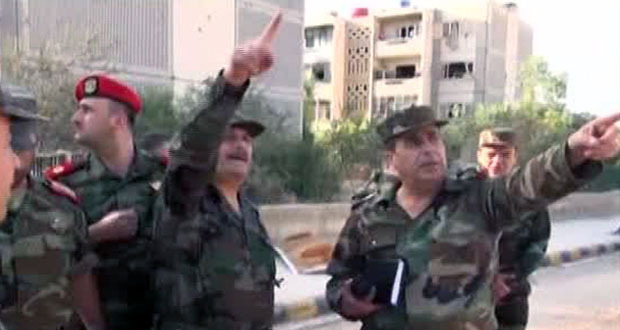 Nasrallah condemned the US and its “willing allies’ air raids in both Syria and Iraq on moral basis even though many analysts claim that defeat of ISIS and other pro-USrael terrorist groups would be good for Iran’s allies (Syria, Lebanon and Iraq) based on the fact that Iran benefitted from the 2003 elimination of Saddam Hussein, a western ally who fought an 8-year war against Iran in the 1980s. “Nasrallah’s speech was significant in that he reminded the world that imperialism will remain our paramount enemy even in this trans-imperialist phase. The Resistance Axis’ policy is one which vehemently rejects this aggression, while not shedding any tears for its takfiri casualties,” commented Amal Saad-Ghorayeb, Lebanese academic, writer and author of book, ‘Hizbullah: Politics and Religion’. “Everyone knows that Hizbullah is against the “ISIL”. Some two months ago I have talked extensively on this. We are against those Takfiri movements, and we are fighting them too. We are offering sacrifices in fighting them. So first we must put aside what some are saying to the effect of our stance from the international coalition as being to defend or to protect “ISIL”. This is simplification and misleading of the facts. So it is either simplification because of ignorance or intended misleading of facts. No, that is not the case. I have tackled the issue of “ISIL” extensively at several occasions in the past. As for us, “ISIL” are groups that kill and slaughter merely because of intellectual and political or organizational disparity. They pose a threat to all the peoples, governments, and sects. So they do not pose a threat to the minorities only but rather to all the peoples of the region. Thus our stance from these Takfiri terrorist groups is clear, firm, and final. It is obligatory to fight them, confront them, and push their danger away from the peoples of the region and the region too. However, the issue of the US military intervention or the formation of an international coalition led by the USA is another issue. This issue must be tackled from several perspectives,” Nasrallah said. “America is the mother of terrorism. Whoever wants to argue, we are ready for argument. America is the source of terrorism in the world. If there is terrorism in this world, search for the US administration behind it. Indeed, we are not talking about the US people,” Nasrallah said. “America is the ultimate supporter of terrorist Zionist entity. The source of terrorism in our region is the existence of Israel, which attains absolute US support whether militarily, security, political, economic, financial, or legal. In the Security Council, even condemning or the right of veto is not allowed when it comes to Israel,” added Nasrallah. “The US fabricated or played a role in fabricating these terrorist Takfiri movements. Therefore, America is not in the moral position that entitles it to lead a war against terrorism. In fact, it never once had a moral position. The side that struck Japan with nuclear bombs, committed atrocities in the Vietnam War, has all of this dark history, stood next to Netanyahu in the 50-day-war against Gaza and the people of Gaza, demolishes, kills thousands, wounds thousands, and displaces tens of thousands from their houses is not morally eligible to present itself as a fighter of terrorism or as a leader of an international coalition to target terrorism,” Nasrallah said. 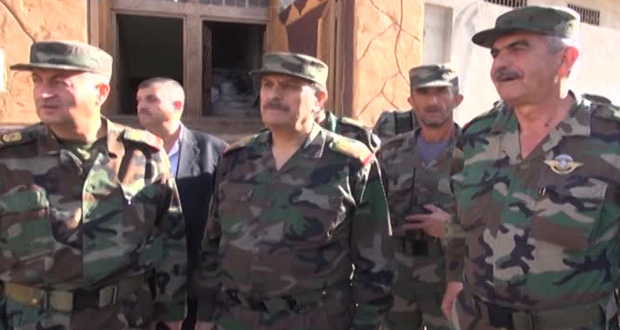 Lt. General Fahd Jaassem Al-Furayj, Defense Minister, and members of the Syrian High Command inspect ‘Adraa’s towns in the aftermath of the spectacular victories here that liberated tens of thousands of Syrian civilians strangled by the fake Wahhabist Islam of the Al-Jabha Al-Islamiyya and Nusra. Another 22 rats were determined to be non-Syrian. 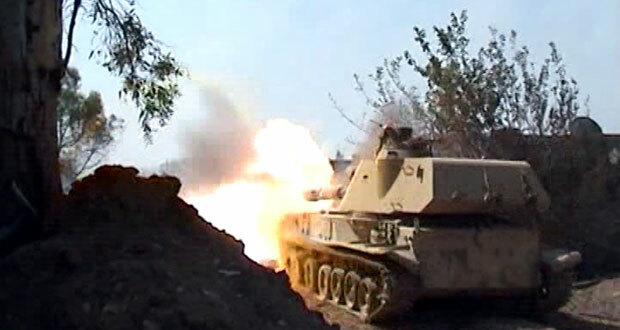 Doumaa: More advances by the SAA. No details. Another 10 could not be identified because they were foreign and carried forged documents. Waadi ‘Ayn Turma: Liberated also. A group of foreign rats gave up and are in custody. Baseema-Dayr Muqrin Road in Waadi Baradaa: More dead rats. No details. -The government is claiming that Daash used chlorine gas and is using this as an excuse for the base having fallenHere are some questions that the above events raise:1) Why was Air Support not provided or supplies not air dropped? Throughout the conflict Iraqi commanders are reported to have ignored calls for resupply and air support and, shockingly, to have given false hope by suggesting that the base was actually resupplied, when it was not. Sour relations between Maliki’s Commanders and Abadi’s desire to replace them is being suggested as another excuse for the fiasco.2) Where are the US air strikes falling? The behaviour of Turkish troops, preventing Syrian Kurds from crossing the border and help their fellow Kurds fight Daash in Kobani, is also very telling. 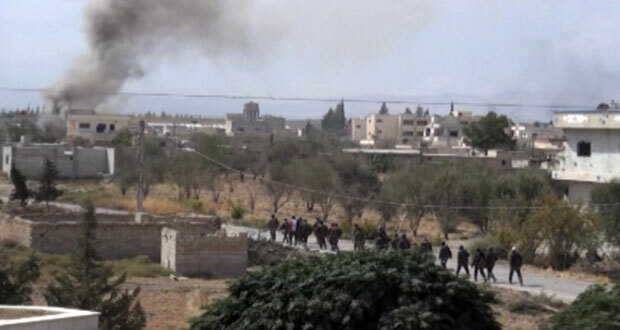 Also, US strikes outside Kobani were unable to halt Daash’s advance. The higher ups in the Ashab Ahl al Haq will be furious that their men at the base were stranded and will want answers if not blood from Iraq’s Political/Military leadership. The military leadership of Iraq, politically selected, has shown little or scant regard for its troops and men, and are perhaps more dangerous than Daash. Filed under: ISIL, kurds, sectarianism, War on Iraq |	Comments Off on Short Analysis by Mindfriedo: Struggle for Iraq: Saqlawiyah says it all! 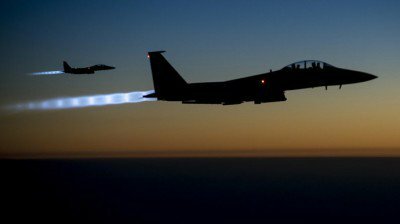 How Did US Warplanes Redirect Its Rocket Launchers from Assad towards ISIL? The United States and its Western as well as regional allies are still attempting to deny the fact that the situation in Syria has drastically changed as its coalition failed to defeat the state and the regular army whose battlefield victories forced the West to join its counterterrorism campaign. In September 2013, the world and the region were on the verge of a US atrocious war against Syria. President Barack Obama’s administration was befuddled by the Syrian army’s battlefield achievements, so it decided to back the terrorist groups in order to involve all the parties in a political process. In fact, all the parties of the axis of resistance were targeted. The Iranian and Russian statements at that time represented a bold response to the US threats. In an interview with Al-Manar Website, the editor-in-c hief of Al-Binaa local daily and former MP Nasser Kandil revealed that clear messages were sent from Tehran and Moscow to Washington that as US rockets target Syria, the axis of resistance’s rockets will be launched onto the Zionist entity, US military bases in the Middle East and onto the countries which support them. Despite the counter threats, the US was not deterred. Media reports asserted that the US war on Syria had started yet ended the moment two ballistic missiles were fired. “The US forces fired these two rockets from a NATO base in Spain, and were instantly detected by the Russian radars and confronted by the Russian defense systems, so one of them exploded in the airspace and the second one diverted towards the sea,” media reports asserted. Kandil said that that political stage was ended by the “Chemical Deal” which let the American administration find a way out of its confusion caused by its recessive stances. The US administration, as a result, refrained from carrying out the military plot against Syria under the pretext of the congressional disapproval, what allowed the axis of resistance to contrive a strategic achievement. The US administration and its regional allies backed establishing the takfiri terrorist groups in Syria and Iraq in order to strike two of the basic resistance strongholds in the region. ISIL (the so-called Islamic State in Iraq and the Levant), the most prominent terrorist group battling the regular army’s and the people in Iraq and Syria, led the takfiri terrorism, displaying its atrocities in different cities and provinces. This terrorism was directed by the US and its allies to defeat the axis of resistance, yet the outcomes of the ground battles proved that the terrorist track did not lead its supporters to achieve any gain in its aggression against Syria. Kandil asserted that the key US interests in the region were directly threatened by the terrorist chaos which started to spread out. Led by Arab-Western intelligence, the terrorist groups may not have strategic plots to attack the Zionist entity; however, since these groups lack a unified command, they usually take uncoordinated decisions, which may endanger the Zionist entity. On the long-term, the Zionist entity’s security might be affected by the case of chaos which will pervade in the neighboring countries due to the takfiri terrorism. In addition, the Western economic and political interests in Iraqi Kurdistan represent a main drive for the US coalition to protect this oil-rich autonomous region. As the terrorist groups threatened of attacking the Gulf countries, the US and the oil-rich states raised the alert in face of the serious terrorist threats. In short, the Arab-Western coalition has decided to strike ISIL which failed to defeat the Syrian troops as well as Hezbollah and started to endanger its interests. Politically, Syria was able to force the United States to abide by its sovereignty standards, what obliged the later to notify the former about the airstrikes which would target ISIL posts within the Syrian territories. Russia and Iran stated that the airstrikes are fruitless if they are not accompanied by a ground attack and considered that fighting terrorism must be a comprehensive policy which halts funding and training the terrorist groups. The two countries preserve their strategic support to the Syrian state against all what may threaten its sovereignty and integrity. Despite Obama’s acknowledgement of the inability of Syria “rebels” to defeat the regular army and in the light of the fact that these “rebels” have been overcome by the Syrian army and its allies since their rise, the western coalition still insists on backing what it calls “moderate rebels” in Syria in order to control the areas where ISIL will be struck by the air raids. As Obama acknowledged that the “moderate rebels” in Syria can never face the regular troops, the US air strikes and the battlefield achievements of the Syrian army will meet in a short time at the point of defeating the terrorist groups, according to Kandil. Former MP Kandil, however, stressed that the battlefield achievements of the Syrian army will have a great role to play in identifying the future of the Arab country which can never be controlled and ruled by airstrikes. The whole region is most probably heading to more political stability and military encounter for the terrorist ISIL. However, if the Western realism withered and the United States insisted on challenging the state in Syria, then all the axis of resistance will be concerned with defending all its strongholds including Syria. قطر: القتال ضدّ “داعش” سيفشل إذا بقي النظام السوري بالسلطة!! Filed under: "Friends of Syria", Arab Zionists, GCC, Iran, ISIL, Nasser Kandil, NATO, Nusra Front, Russia, SAA, Takfiris, US Foreign Policy, USA, War on Syria, Zionist entity |	Comments Off on How Did US Warplanes Redirect Its Rocket Launchers from Assad towards ISIL?